LANCASTER – Lancaster is joining the worldwide crosswalk art movement on Monday, Jan. 28, when the city will begin installing a series of murals by street artist The Art of Chase in the intersection crosswalks of The Blvd and Ehrlich Avenue. The intersection will be closed to street traffic for this event, but residents are encouraged to come out to see the artist in action from 8 a.m. to 1 p.m. each day, until the installation is complete. The project is estimated to conclude on Wednesday, Jan. 30. 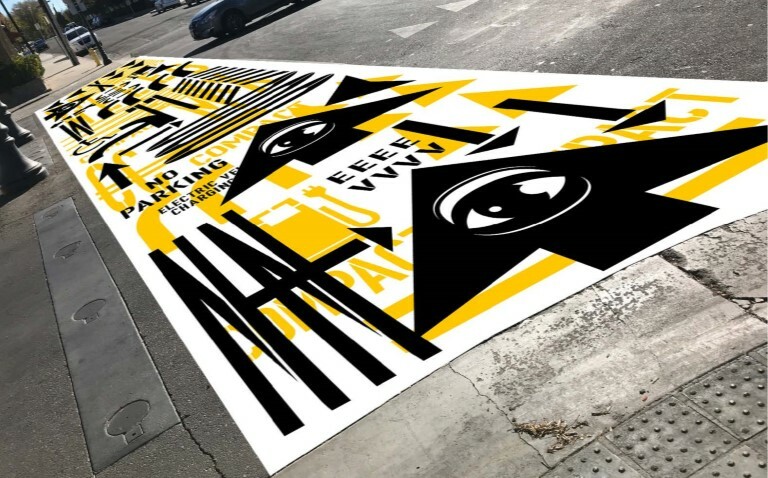 Chase, who is known for his quirky and humorous paintings, will use the city’s existing road marking stencils to create four unique crosswalk murals. The symbols, lettering, and arrows will be patterned and layered to create artwork that feels strangely familiar until the viewer realizes that the artwork is a mash-up of roadway signage. This design is intentionally crafted to bring a whole new meaning to the term ‘street art’. For daily updates on this project, visit the city of Lancaster’s Facebook page. Chase moved to Los Angeles from Belgium in the 1990s to skateboard and enjoy the budding art scene. This is where Chase began his foray into the street art world on a large scale, offering a new mode of communication through imagery and quirky text. Chase’s mantra “where there’s a wall, there’s a way,” has given rise to more than 400 The Art of Chase murals worldwide. For more information regarding The Art of Chase, visit www.theartofchase.com. 1 comment for "Lancaster to host crosswalk art installation event"